Charon was the son of the primordial Gods Erebus (God of Darkness) and Nyx (Goddess of Light). The name Charon means 'fierce brightness' in Greek, and the Roman's equivalent was Charus. He was the ferryman of the dead, an underworld daimon (spirit) in the service of King Haides. He received the shades of the dead from Hermes who gathered them from the upper world and guided them to the shores of River Acheron. The Acheron was also known as the River of Pain that flowed from the Styx and believed to carry pains intended for mortals back to earth. It also carried the good souls from the Underworld that were sent back to earth to be reincarnated as mortals. Those who had not received due burial and were unable to pay his fee, would be left to wander the earthly side of the Acheron, haunting the upper world as ghosts. Although Hermes might have taken the souls of the dead to the banks of the river for free, Charon demanded his fee. From there Charon transported them in his skiff to a final resting place in Hades, the land of the dead, on the other side. 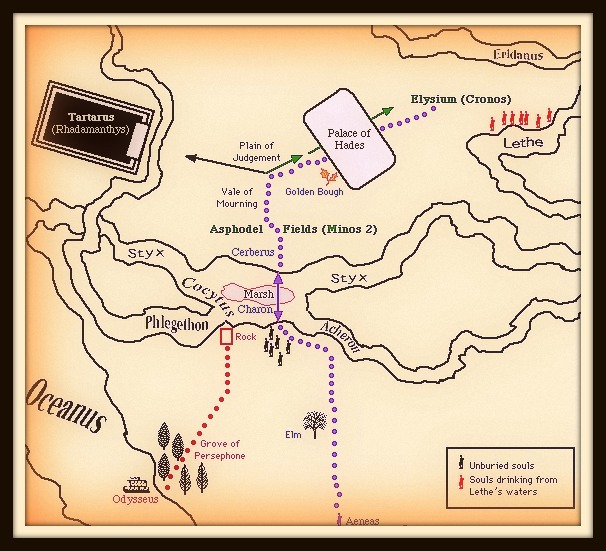 The fee for his service was a single obolos, a coin a silver coin worth a sixth of a drachma, which was placed in the mouth of a corpse at burial (It was known as Charon's obol). People who are unable to pay the fee are doomed to wander the shores of the river for a hundred years. 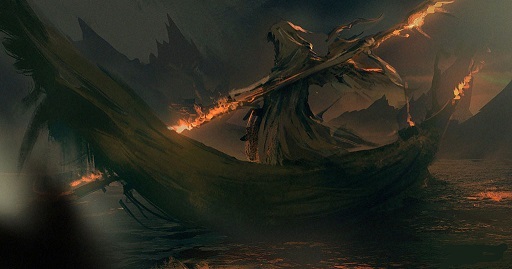 Living people who want to visit Hades must also pay the ferryman. Given the fact that they needed two trips, Charon charged significantly more, and several myths and stories indicate that visitors to Hades payed with a golden branch to cross the river and then return. In the catabasis mytheme, some heroes - such as Heracles and Dionysus- travel to the Underworld and return, still alive, conveyed by the ferry of Charon. Several Greek and Roman authors wrote about traveling to the Underworld, usually with the assistance of an experienced guide. Dante, for example, wrote "The Inferno", and "The Aeneid" by Virgil also features a trip to the Underworld.